As individuals and families prepare for annual tax filings, organization can be a huge help or hindrance. Whether you have kept impeccable receipts for all the expenses or just have a pile laying on a desk, organizing all the information into files and folders can be a time saver. Smead offers a wide variety of folders that can make quick work of your document organization. Whether filing yourself or getting assistance, having all the documents in a single location is imperative. The 12-pocket stadium file from Smead is a good choice. With deep pockets and 12-slots, each set of materials can be held separately and securely. The tiered pockets offer better visualization of all the files. With space for 900 sheets of paper, each and every document can be complied in one place. 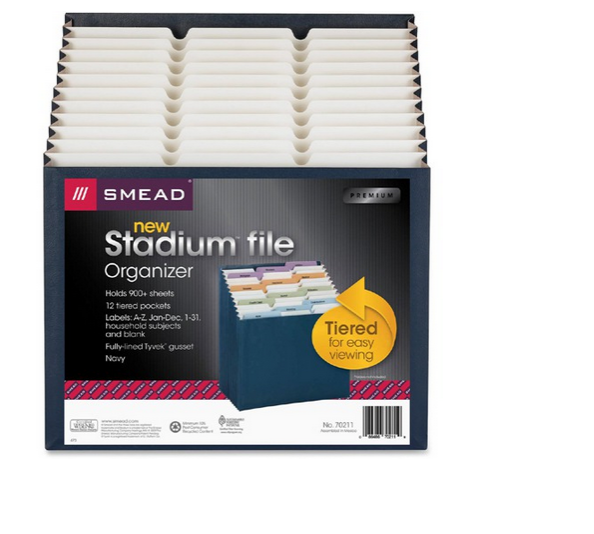 The Smead 12-pocket stadium file retails for approximately $22. After all the document support is gathered, there are usually a few items that require signature. Since these items need to stay in pristine condition, a regular folder may not be the best choice. The Smead 3-in-1 SuperTab Section Folders offer a lock-it flap to keep papers secure. No more worrying about papers falling out or becoming jumbled. From large, regular sized papers to smaller receipts, everything can be held securely. These folders with three pockets can keep everything in proper order. Once all the papers are gathered, organized and ready for filing, the final document can be completed. After it is sent, all those papers need to be filed away. The Smead SuperTab tab file folder can fit in any drawer. With a 90% larger label area, these folders are easy to find in a cabinet. Whether you like bright pink or a classic neutral, this 6-pack of folders will keep the filing cabinets organized. No more procrastinating. Gather, organize and file all your documents with the help of Smead products available for purchase at Shoplet.com today. Disclosure: The writer may have received these items for review purposes. All opinions are her own and were not influenced by any person or entity.